I'm interested in the new Samsung 8.4, but can someone explain what does it mean that the tablet comes with no DivX and AC3? I am sure that if it was a big issue Samsung would have put it on, or am I wrong? Android and iPad only lineup? Boring!!!! I wish for a 10 inch tablet with 720p screen, without cameras and without microphone, thin, light and with good specs (2GB RAM, 16GB storage and good CPU and GPU). And only Wi-Fi, in order to be cheap. Is there a tablet like this? Can xperia z2 tablet available in India I eagerly waiting for the same. MrPetya19, 03 Jun 2014The Asus Memo 10FHD has an lte version in Europe. It has a Snapdragon S4 pro instead of the i... moreTrue. It has specs similar to Sony Xperia Tablet Z LTE, but the chipset gets recognized by CPU-Z as Snapdragon 600. Unfortunately its much less known than its Intel WiFi only version. X, 03 Jun 2014You call a 799$ useless brick a tablet? In order to use it, you need to throw in over 1000 dol... moreYeah right! And goats fly. I have seen many but you are a unique one... Nice talking to ya..
AnonD-134497, 03 Jun 2014I don't care about Android tablets but you know, you are sounding a bit ignorant. Surface Pro ... moreYou call a 799$ useless brick a tablet? In order to use it, you need to throw in over 1000 dollars. And then it becomes a kind of failed laptop. The Asus Memo 10FHD has an lte version in Europe. It has a Snapdragon S4 pro instead of the intel atom soc. I don't care about Android tablets but you know, you are sounding a bit ignorant. Surface Pro tablets run circles around anything outside. Oh and have you seen how think the Surface Pro 3 is comparing to the previous versions? Keep living in your fantasy worlds while I live by the fact that the hybrid of a tablet/laptop Surface Pro 3 is miles ahead of the competition. X, 03 Jun 2014This article has no purpose to exist. 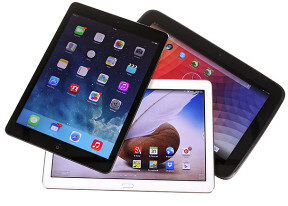 The only tablets worth the money are the iPads. Android ... morePlease wake up. This article has no purpose to exist. The only tablets worth the money are the iPads. Android tablets are buggy and the apps are not optimised for them, and the Surface tablets...LOL! 500$ for an iPad is still cheaper that 100$ for a piece of junk you'll throw away after few days, maybe months, and absolutely cheaper than a brick heavy Surface tablet. The only cheaper tablet is Samsung Note 10 which is given for free in many countries, be it together with a new SGS 5, a new cable TV contract, and so on. Funny how MediaPad X1 is called Honor X1, a phablet, and sold for only around $300. Where is Tegra note 7? This is second tablet list of this year, still both the lists have the nexus 7 but not Tegra Note 7? Heck, it only costs sub 200$ still no one mentions it..
Nexus 7 and Ipad 2 feels like toys compared to my Surface 2.I don't know what apps you can't live without on your tablets? There is most certainly some app that can do the work you demand. Hey guys! I have a question.which one of these tablet is the lightest slimest and also the most element resistence?